Syracuse, NY - The Syracuse Salt Potatoes had four more hits than the Rochester Plates, but Syracuse lost to Rochester, 3-1, on Saturday evening at NBT Bank Stadium in the Duel of the Dishes. José Marmolejos had three hits, including a home run for the Salt Potatoes in the game. Syracuse has now had more hits than its opponent in seven straight games. Syracuse (57-74) struck in the bottom of the fourth inning against Rochester reliever Luke Bard. Marmolejos took the first pitch of the inning and drilled it over the right-field wall for a solo home run that put the Salt Potatoes ahead, 1-0. Rochester (59-71) scored all of its runs in the top of the fifth. Syracuse starting pitcher Erick Fedde retired the first two batters of the inning, but with two outs, Juan Graterol walked. Alex Perez followed with a single, moving Graterol to second base. Syracuse then brought reliever Josh Edgin into the game. Edgin hit Byron Buxton with a pitch to load the bases. Nick Gordon followed with a bases-loaded walk, scoring Graterol and tying the game, 1-1. Gregorio Petit then singled to left field, bringing home both Perez and Buxton to give the Plates a 3-1 advantage. 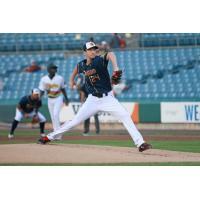 Fedde, in his Major League rehab start, pitched four and two-thirds innings, allowed three hits, two runs, two walks, and struck out six batters. The Salt Potatoes and the Plates continue their four-game series on Sunday afternoon with the third game of the series. RHP Phillips Valdez is scheduled to pitch for Syracuse opposite LHP Lewis Thorpe for Rochester. First pitch is set for 1:05 p.m.